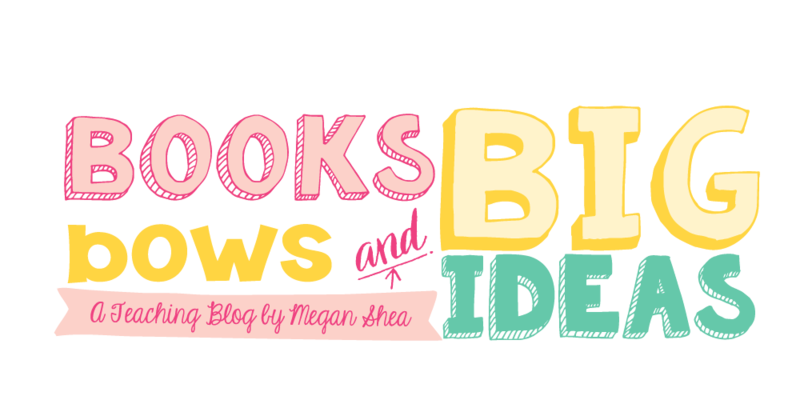 Books, Bows and Big Ideas: Fun Halloween Activities! I absolutely love this time of year in kindergarten! 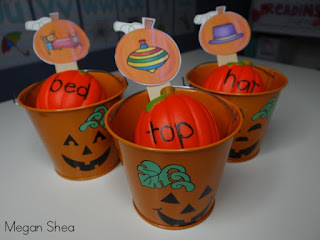 The kids are so into Halloween so they love when we incorporate Halloween into our activities. I really love hands-on, fun center activities. Kids love novelty and connecting novelty with the seasonal things that they love is so motivating. 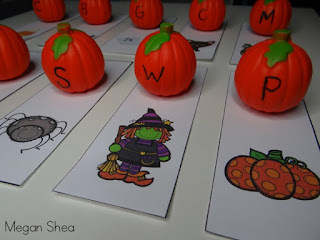 Here are some fun ideas for Halloween. All of these ideas contain items from Oriental Trading. Click here to view Oriental Trading's Halloween site! I love having things like this on hand for children that finish early, or if you have a short block of time and do not want to start something new. They are all super easy! 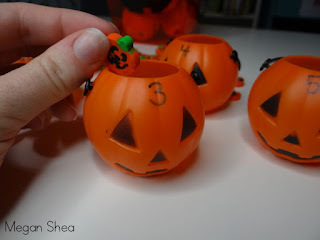 This first activity is so easy and perfect for those kids that still need a little help with fine motor skills. 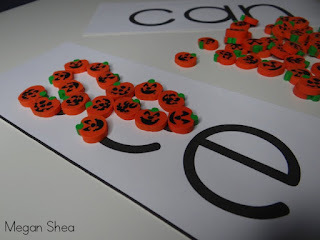 It is also a great tactile activity for your kinesthetic learners. Just write or type sight words, letters, words, names, etc. 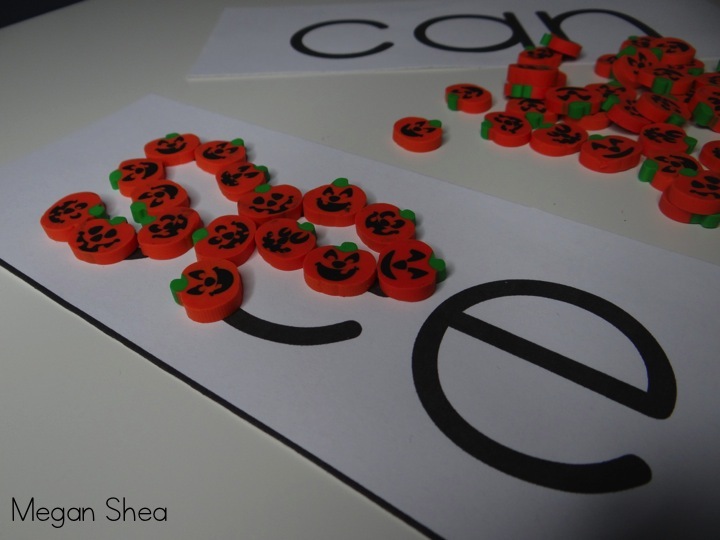 on a piece of paper and have your kids place little themed erasers on top to create the word. This set is from Oriental Trading, and it came with TONS of erasers. The next activity also uses those little erasers, but also uses these cute little jack-o-lanterns. 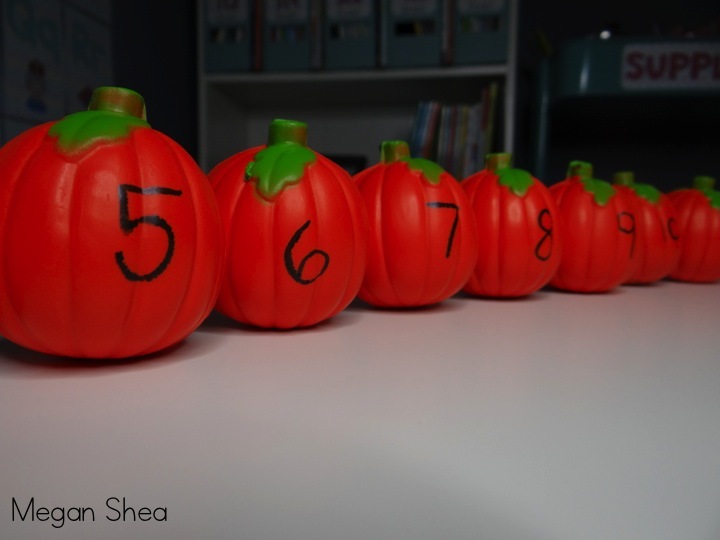 Just write the numbers, then have your students count out that many erasers and put them inside. SO EASY! This next activity is for beginning sounds. 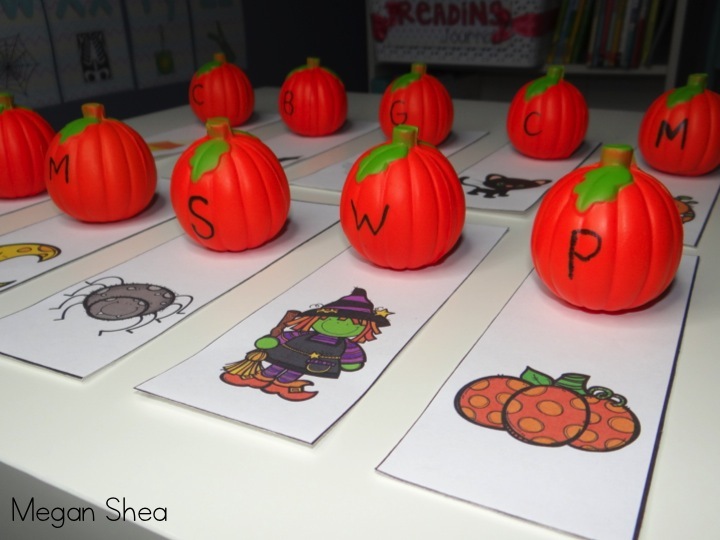 Those pumpkins are actually stress balls, but I thought they would be perfect for a matching activity. All you have to do is put out pictures and write each matching beginning sound on a pumpkin, then have your students match them up. Click here to download the picture cards that I used. 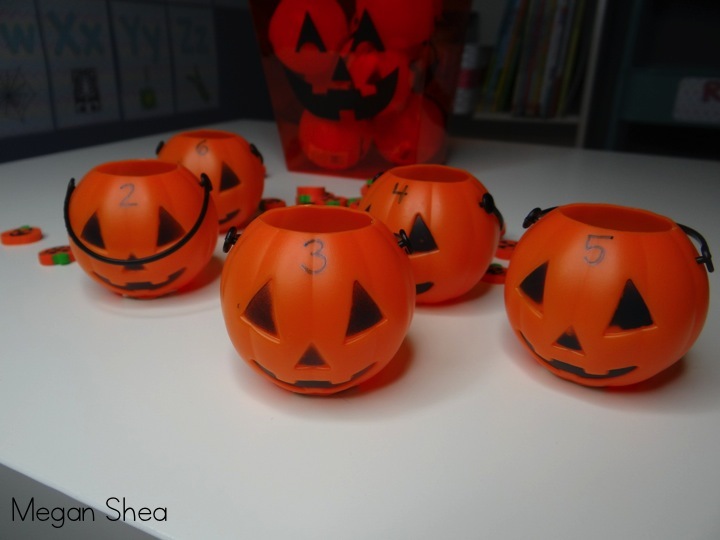 The next one also uses the stress ball pumpkins. All I did was write each number (1-12) on a pumpkin and have the students put them in order. You can also have them match them to a ten frame or number card, start at a given number and put them in order, etc. 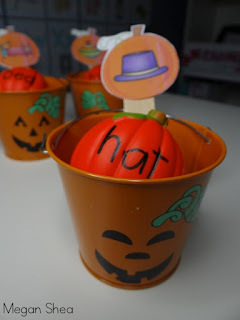 The next idea uses these cute little buckets, as well as the stress balls. I put CVC pictures on a popsicle stick and put one in each bucket, then I wrote all of the words on the pumpkins and had the students match them up. Click here to download the pictures that I used. I also got these cool buckets, I think they are meant for party snacks, however I am keeping each activity inside of one of these buckets. The kids can just grab a bucket and everything is inside. 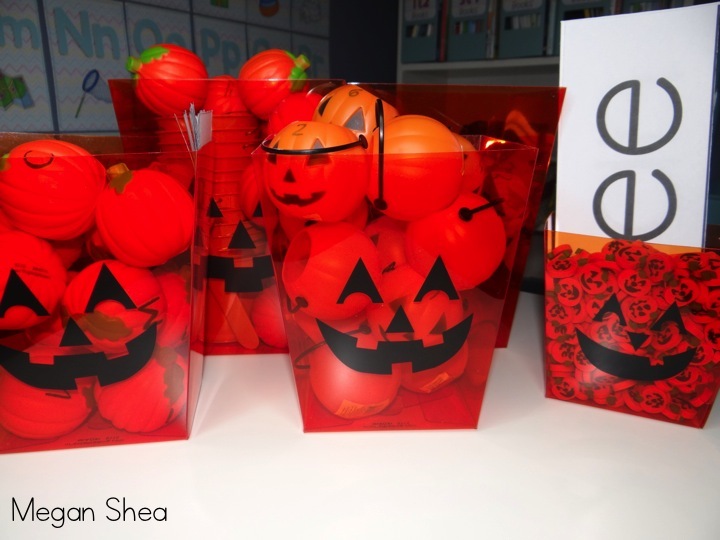 They are thin plastic, so I am not sure how well they will hold up, but hopefully they will last until Halloween! This review is based strictly on my opinion. Others may have a different opinion or experience with the product listed above. I was provided the sample free of charge by Oriental Trading and I provided my honest opinion. No other type of compensation was received for this review.